Summary: Michael Schofield’s daughter January is at the mercy of her imaginary friends, except they aren’t the imaginary friends that most young children have; they are hallucinations. And January is caught in the conflict between our world and their world, a place she calls Calalini. Some of these hallucinations, like “24 Hours,” are friendly and some, like “400 the Cat” and “Wednesday the Rat,” bite and scratch her until she does what they want. They often tell her to scream at strangers, jump out of buildings, and attack her baby brother. A New York Times bestseller, January First captures Michael and his family's remarkable story in a narrative that forges new territory within books about mental illness. In the beginning, readers see Janni’s incredible early potential: her brilliance, and savant-like ability to learn extremely abstract concepts. Next, they witnesses early warning signs that something is not right, Michael’s attempts to rationalize what’s happening, and his descent alongside his daughter into the abyss of schizophrenia. Their battle has included a two-year search for answers, countless medications and hospitalizations, allegations of abuse, despair that almost broke their family apart and, finally, victories against the illness and a new faith that they can create a life for Janni filled with moments of happiness. JANUARY FIRST: A CHILD'S DESCENT INTO MADNESS AND HER FATHER'S STRUGGLE TO SAVE HER by Michael Schofield is not a book that I'd typically read. While I do enjoy the occasional memoir, books about mental illness and children aren't ones that I usually seek out. However, I was definitely intrigued by the description of JANUARY FIRST. In addition, I've seen some marvelous reviews for this book popping up around the book blogosphere. 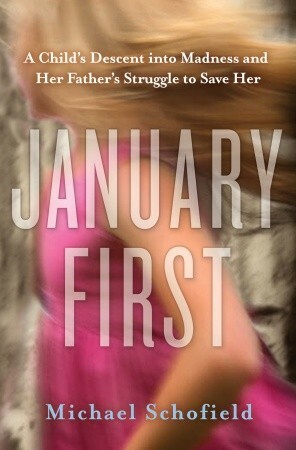 JANUARY FIRST is a father's story of bringing up a young daughter with schizophrenia. Michale Schofield and his wife always knew that their daughter Janni was a difficult child. She was restless, prone to tantrums, and seemed to live in her own little world. As a parent, I realize that those descriptions can describe many, if not most, children (mine included! ); however, these conditions in Janni were extreme. So extreme, that she would even try to seriously harm her baby brother when he cried. For two years, her parents tried to get Janni some help, but doctors were hesitant to give her "disease" a name. In addition, their insurance company's rules were such that it was hard to have Janni kept under observation for more than a few days. Janni was finally diagnosed with schizophrenia and doctors began trying to find a combination of drugs that would help Janni have some relief from her pain and suffering. Ultimately, the Schofields had to find ways (some rather drastic and unconventional) to deal with Janni and keep their family together. Naturally, JANUARY FIRST is a tragic story about a family on the edge and it broke my heart. That's not to say that there are moments of hope, but overall I found it very difficult to read about Janni's behavior. My heart went out to the entire Schofield family because no one is equipped to handle a situation like this; and I felt frustrated that they had to battle their insurance company time and time again just to get Janni the help she needed. I just kept thinking the entire time I read this book that something this tragic could happen to any of us... any time; and I quite honestly don't know how I'd handle it. However, I have a feeling that I'm going to be in the minority when I say this, but I am very torn about whether I "liked" the book. Of course, the subject matter is horrific so "like" is an odd choice of words to use, but I just found that I thought the book was just "okay." That's not to say that I didn't devour the story because I read it very quickly -- it was almost like a car wreck in that I didn't want to look at it, but I couldn't help myself. Rather, I just had some general issues about the writing and how the story was told. For example, there were a few occasions when major incidents would just seemingly come out of nowhere -- with little, if any, explanation. It's possible that I missed an earlier reference, but I just thought something was off with the pacing and/or flow of the book. In addition, I had a very hard time relating to how the Schofields handled Janni's behavior; and there were even a few times when I registered disbelief over Mr. Schofield's story. I feel horrible for saying that considering what the Schofield family has been through; and I know I couldn't have handled things any better if I had had a child like Janni -- who am I to even question what they tried to do to save their daughter? It's just that I felt as if I were missing some aspects of their total story. JANUARY FIRST would make for a very interesting book club pick. There is no doubt that this book generated a lot of different reactions from me (including rage, disbelief, disapproval, and sympathy), and I'm sure my friends would feel similarly. I can only imagine the discussions we could have about parenting, mental illness, and health care -- all very controversial subjects! Overall, JANUARY FIRST was a fascinating read, albeit a disturbing one. I recommended to fans of memoirs and readers who enjoy books about mental illness. If you'd like to learn more about Michael Schofield's story, you can check out his blog Jani's Journey. I found this book VERY compelling but had some issues with it as you well know. I talked about the book to everyone as I read it so I agree that it would be a great book for a book club. I definitely know what you mean about the definition of "like.". I feel that way when I rate too. Even if it was really good, if it was painful to read, how do I rate it? Schizophrenia is hard to read about and it must be more so when it has to do with a child. I don't know if I would be able to read this story. I may just freak out over the unconventional treatment. I've been talking to Kathy about this book, and I think she is going to loan me the audio. I'm intrigued, even though I know it is going to be a messy, ugly read. I did NOT realize this was a true story! Holy cow. I really can't wait to listen to it.